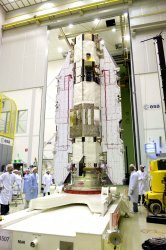 ESA's GOCE satellite has been orbiting the Earth for more than a year and surveying its gravitational field more accurately than any instrument previously. The goal of the researchers – including scientists at the Technische Universitaet Muenchen (TUM) – is to determine the gravitational force in precise detail even in pathless places like the Himalayas. Evaluations of the first data from the satellite indicate that current models of the gravitational field in some regions can be fundamentally revised. On that basis, researchers expect to develop a better understanding of many geophysical processes, including for example earthquakes and ocean circulation. Another success: The satellite will probably manage to work in space for a much longer period than intended. Gravitation is one of the fundamental forces of nature, but it is by no means the same everywhere. Earth's rotation, height differences of the surface, and the composition of the crust cause significant differences in the global gravitational field. Measuring the field with previously unattainable precision – thereby contributing to the understanding of its effects – is the task of GOCE (Gravity Field and Steady-State Ocean Circulation Explorer), which lifted into earth's orbit on March 17, 2009. In addition, GOCE is expected to provide the basis for the most accurate calculation of the "geoid" possible. Geoid is the name given to the virtual sea level of a global ocean at rest, which is used, for example, as a height reference for construction projects. In recent months, researchers from the GOCE Gravity Consortium, a group of ten European institutes from seven countries, have processed data from the satellite in such a way that it can be used for model calculations. They can already see that GOCE will enable significant progress to be made in mapping. "It is becoming clear that we are receiving good information for the regions that are of interest from a geophysical point of view," says TUM geodesist Prof. Reiner Rummel, chairman of the consortium, who presented the first interim results of the mission on May 7 at the General Assembly of the European Geosciences Union in Vienna. The scientists had suspected that there were large inaccuracies in the previous models, calculated on the basis of conventional methods, particularly in the Himalayas, parts of Africa, and the Andes The initial evaluations of the GOCE data do indeed confirm this hypothesis. "Measurements made from the surface of the Earth in regions that are difficult to get to carry a high risk of errors," explains Rummel. "This is not a problem for the satellite, of course." Not only the data, but also the satellite itself is proving to be very robust. It was originally intended to carry out the actual measurements for one year from October, with a break after six months. However, GOCE's energy supply is operating so well and its stability is so high that this rest phase was not necessary. "We hope we can continue to measure for even three to four years," says Rummel - and this despite the extremely challenging track the satellite is on: Its working height of 255 kilometers is the lowest Earth orbit ever for a scientific satellite. Its path must be continuously corrected with an electric ion propulsion system so that it does not crash to Earth. "This works extremely well," says Rummel with delight. The Sun, which has been behaving extremely peacefully in recent months, is aiding the mission. Stronger solar activity would increase the aerodynamic drag and thus make control more difficult. The scientists expect the mission to enable better understanding of many processes both on and below the surface of the Earth. Because gravitation is directly correlated with the distribution of mass in the Earth's interior, mapping gravitation in detail can contribute to better understanding of dynamics in Earth's crust. Understanding better why and where the movement of tectonic plates causes earthquakes is of great significance, particularly for regions on plate boundaries such as the Himalayas and the Andes. The researchers hope that the mission could eventually contribute to development of an early warning system for earthquakes. With the aid of the new data, scientists also want to measure ocean circulation globally, precisely, and in detail for the first time. The ability to measure changes to ocean circulation and sea level is crucial for all global climate studies. Until now, ocean circulation has mainly been derived from mathematical model calculations. Surveying should also profit enormously from the GOCE data. The exact reference planes can be used to correctly compare the heights of the Earth's surface on different continents. Through coordination with measurements from satellite navigation systems (e.g. GPS or GALILEO), it will be possible in the future to make such data available with centimeter accuracy to every user. And last but not least, it also will become simpler to plan the construction of roads, tunnels, and bridges. The consortium scientists, coordinated at the TU Muenchen, will now use the pre-processed data to develop an initial global model of the gravitational field. It will be presented at the Living Planet Symposium of the European Space Agency ESA at the end of June in Bergen, Norway.